The first North American edition of the Performance Polyamides conference took place November 14 - 15, 2017, at the Pittsburgh Marriott City Center in Pittsburgh, Pennsylvania, United States. This two-day event examined the latest polyamide resins advances for demanding applications in markets such as the automotive, electrical/electronic, medical, consumer goods, construction and industrial sectors. An international line-up of influential speakers explored how improvements in the properties and processability of polyamides are accelerating the development of new applications, including a focus on metal replacement. Industry experts also discussed market opportunities and new applications, including case studies from a range of markets. The high-level program will covered developments in PA 6, PA 66, PA 46, PPA and other polyamide chemistries including biobased PA resins made from renewable resources. Make a lasting impact on AMI´s senior management audiences and become an official sponsor at the Performance Polyamides 2017 conference. Enables you to raise the profile of your company, positioning yourself as a market leader in the industry! Benefit from AMI’s extensive marketing exposure. We promote the event to our extensive databases, and target new customers through ads in our online magazines. In addition, conference brochures are mailed to thousands of potential delegates across the globe. Increase awareness of your company’s products and services among key industry players and prospective clients. Allows you to expand your business opportunities and network with future customers. Our high value technical conferences attract senior level delegates and participants covering all aspects of the supply chain from all over the world. 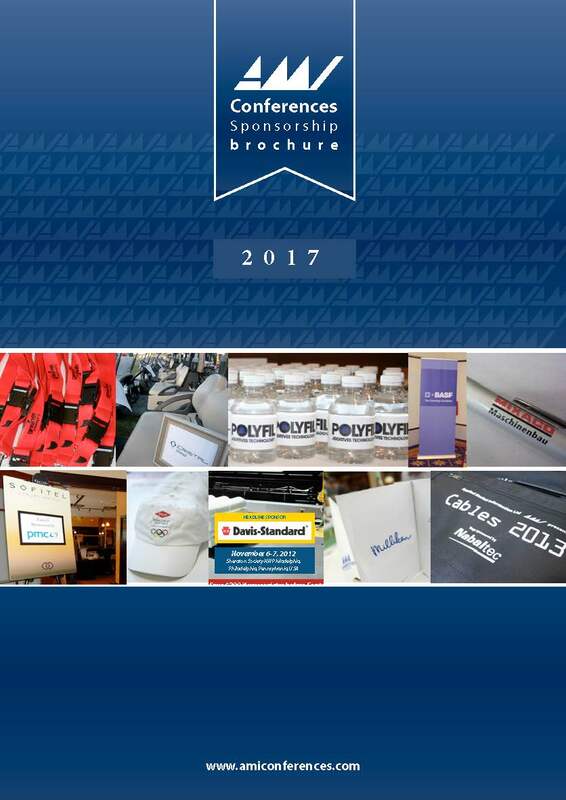 Don’t miss an opportunity to further your business potential – sponsor an event today! The conference proceedings for Performance Polyamides 2017 are available for sale in electronic format for $425 + postage. If you would like to purchase a copy of the conference proceedings, please contact Mr. Michael Wagner, Conference Coordinator at michael.wagner@ami.international or at +1 610 478 0800. We are planning to return to the Pittsburgh Marriott City Center on November 6-7, for Performance Polyamides 2018! If you or a colleague would like to speak at next year's conference, please complete and return an abstract submission form before April 27, 2018.